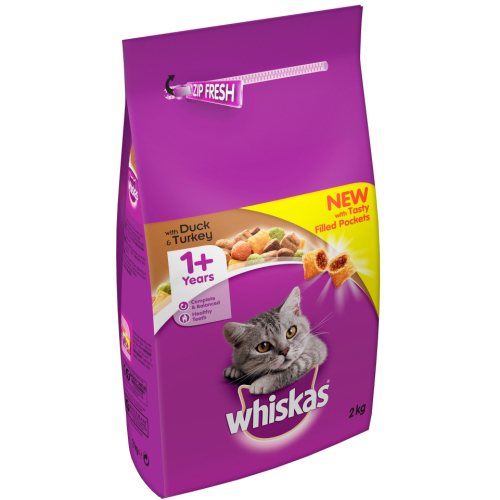 Whiskas 1+ dry cat food offers everything your adult cat nutritionally needs for a happy and long life. These crunchy kibbles have a crunchy shell with a soft and tasty duck and turkey flavoured centre. The crunchy shell helps to clean plaque off your cat’s teeth with its gentle abrasive effect. Cereals, Meat and Animal Derivatives (including 4% Duck and 4%, Turkey in the Light Brown Kibbles), Vegetable Protein Extracts, Oils and Fats (0.25% Fish Oil, 0.1% Sunflower Oil), Derivatives of Vegetable Origin, Minerals (including 0.2% Sodium Tripolyphosphate), Vegetables (4% Carrots in the Orange Kibbles, 4% Peas in the Green Kibbles), Antioxidants, Colourants from Natural Origin. Protein 32%, Fat Content 10.5%, Inorganic Matter 8.5%, Crude Fibres 1.5%.